Generally, you can buy any reversing camera which outputs Composite Video in NTSC or PAL mode. Most cameras work in the same way. That is, they receive power from the reversing light circuit in the vehicle. Once powered on, the camera generates a video signal, which gets transmitted to the Video-In socket of the connected Navigator (or other display device). Once the Navigator receives an incoming video signal, it is displayed. The reverse camera video display would normally override any other video signal which is currently visible on the display (such as a GPS display etc.). Most of the systems in use are designed to power up the camera when the car is put into reverse gear. If you want to be able to power up the camera while moving forward, the camera would have to have a switch wired in to allow the camera to be powered on when the car is in forward gears. This could be done by an auto electrician for example. 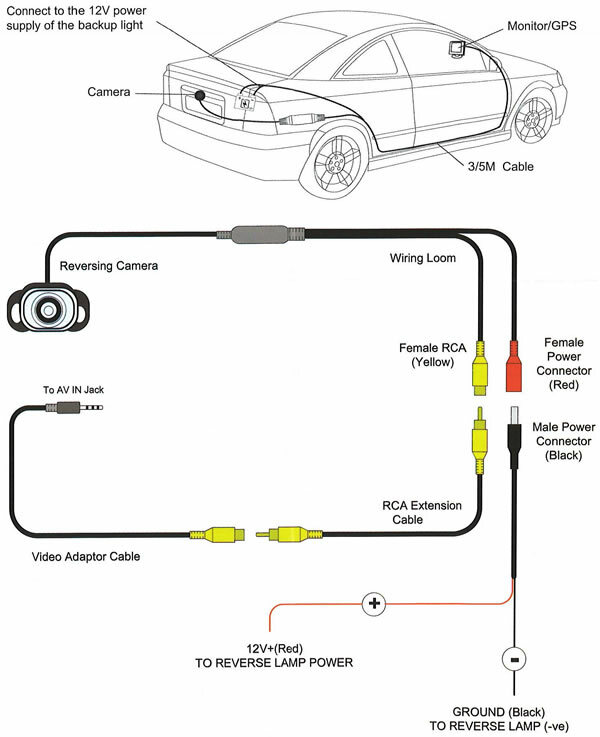 Some reversing cameras may be different, or have different wiring looms supplied with them. Contact the manufacturer or the supplier of the camera for details of their video outputs etc. Some cameras output their video signal in a way which causes the image to appear mirrored left /right or flipped. In many cases, the camera itself may have a small wired link which, when connected, will cause the image sent by the camera to be mirrored to counter this issue. We are also aware of some cameras (Response brand from Jaycar being one) which have a small screw fitting on the body of the camera which reverses the left / right mirroring of the image when removed. These flipping mechanisms are present so that the camera can be used as a "normal" surveillance type camera, or as a reversing camera. There are wireless systems available, where the camera is connected to a small transmitter, and there is a receiver adjacent to the display device. We have found these to be prone to interference, and generally do not recommend them. Some systems have multiple (usually two) cameras. These work in exactly the same way. The wiring loom usually has a some sort of control box between the two cameras, and the rear-most camera "takes over" when plugged in. Of course, this behaviour can be changed by changing the wiring setup. The Hema Navigator products can only display ONE video signal at a time. There is no facility to show two cameras in split-screen mode etc. Any control of multiple cameras is performed OUTSIDE the Navigator. ie. the Navigator can only display ONE image at a time. Be aware that even though most cameras have similar specs "on the box", that their output quality, brightness etc. may vary dramatically. You would be well advised to test any prospective camera purchase while connected to your specific Navigator prior to purchase / installation of the camera.